Thanks to Thomas Romo's treatment, Jared Galicia is starting to feel happier and healthier. 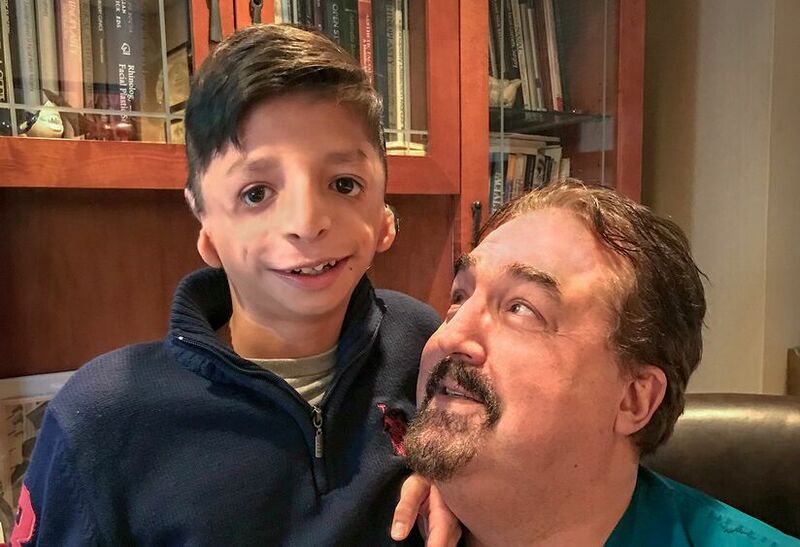 Jared Galicia, a soft-spoken 13-year-old boy from New Jersey born with Treacher Collins syndrome, a debilitating facial disfigurement, has gained invaluable confidence since he began undergoing a series of free reconstructive surgeries in 2017 with the help of Lenox Hill Hospital and the Little Baby Face Foundation. His mother, Sandra Jimenez, noticed a change in her son’s typically shy demeanor after his first two procedures, which gave him new ears — Jared was born with only earlobes. In addition to affecting the appearance of the ears, Treacher Collins syndrome can cause deformity of the cheekbones, jaw and chin, and often causes downward-slanting eyes, a very small jaw and chin, as well as hearing and vision loss. People may be familiar with the syndrome because it was featured in the best-selling book Wonder, which was recently was adapted to the big screen in a film starring Julia Roberts, Owen Wilson and Jacob Tremblay. The surgeries have boosted his self-esteem. His attitude has changed for the better. He likes to wear his hair short now so people can see his ears. And with ears, his glasses don’t fall down. Thomas Romo III, MD, Lenox Hill’s director of facial plastic and reconstructive surgery, and his team shaped and refined Jared’s earlobes and canals and placed a titanium component deep inside the ear, the first step toward giving Jared bone-anchored hearing aids to address his hearing loss. Dr. Romo is also improving the structure of Jared’s cheeks with a less invasive procedure. “His cheekbones are flat, so we’re using a filler, or an injectable product for cosmetic facial rejuvenation,” he explained. Future surgeries may include correcting Jared’s deviated septum, so he can breathe more freely through his nose, rather than his mouth. To further help with Jared’s facial reconstruction Dr. Romo is also discussing the possibility of 3D-printing bone with his colleagues at the Feinstein Institute for Medical Research. Comprehensive reconstructive surgical services for children are part of the hospital’s overall plans for expanding the pediatric care at Lenox Hill’s ambulatory facility, Manhattan Eye, Ear & Throat Hospital. In the works are recovery areas where parents can stay with their children, reconstructive ophthalmology services for patients with eye abnormalities and ear, nose and throat surgery for procedures as simple as tonsillectomy.